Look for the lighting patterns :). You can deduce the traps based on how lights fade out. But good suggestions. 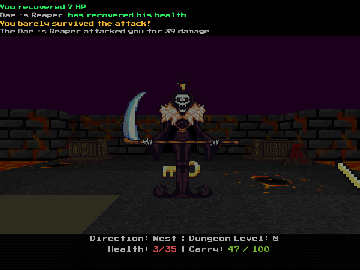 Going to revisit the game again after I finish the anniversary update for Ebony Spire (it drops this weekend). No Linux version? Was looking forward to playing it! 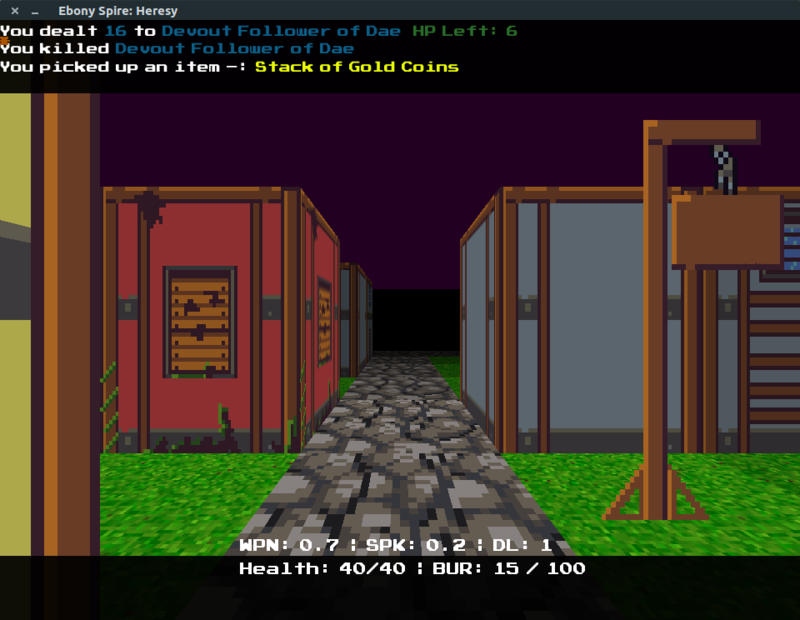 Posting here to let everyone know I just released an update to my first person dungeon crawler that turns it into a full blown roguelike! 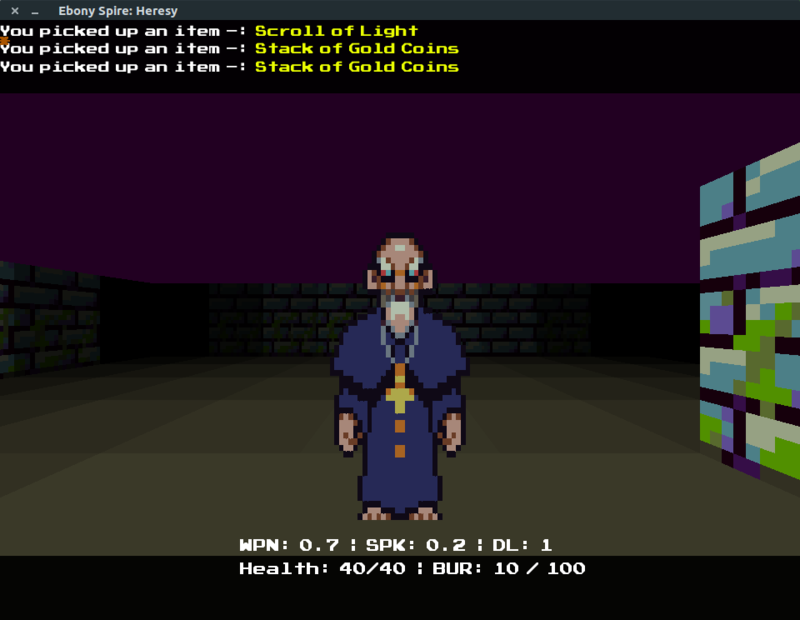 The game is called Ebony Spire: Heresy and it's a first person dungeon crawler that revolves around item usage: Throwing, equipping, activating, triggering and getting hit by them! It's turn based with grid movement and played from a first person perspective. It's played entirely with a keyboard the the code behind the game is licensed as MIT so you can use it to make what ever derivative you want or mod the hell out of it. You can play a five levels demo up to the first boss fight that features a golem that throws boulders at you. 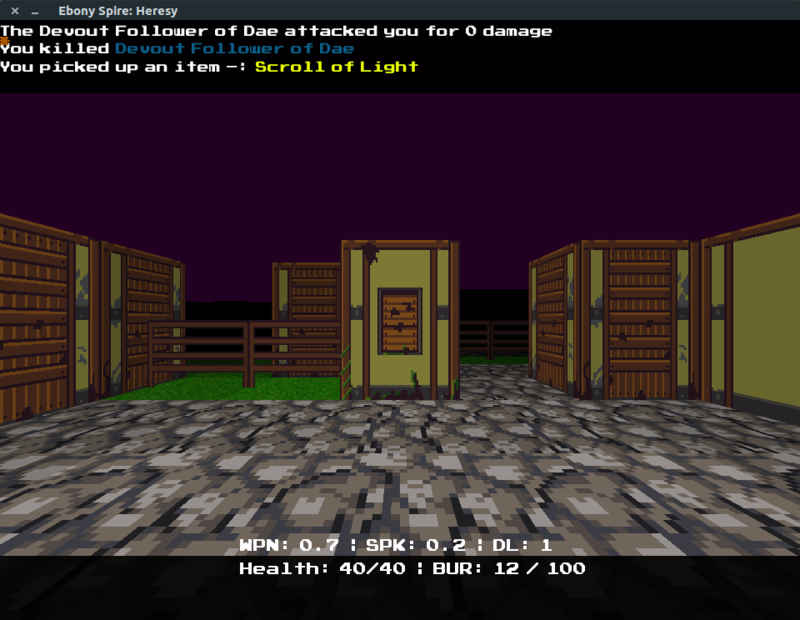 There are guns, swords and all kind of spells and items in the game that you can use. The game features 10 levels with optional but highly recommended portal levels that will get you guaranteed items. Here's a link to the demo, If anyone wants to try the full game but can't afford it let me know. It's available for Windows and Linux but I also have a unreleased Mac version for you guys to try! As promised in the previous post the Clujotronic Demo is up for grabs showing the new direction the game is going! And with even better news, Ebony Spire is set to launch on steam at the end of October! The steam page will go up in just a few days. Everyone who already purchased the game will receive a steam key. Download the demo, purchase the Beta at a discount and read the press release I posted on medium. See you guys atop the Ebony Spire! I'll be demo-ing the new build of Ebony Spire Heresy @ CodeCamp fall edition in Iasi and will release a new update after the feedback process from CodeCamp. If you're in the vecinity, drop by and say hi! I'm also hosting a panel on Game Design / Development during the confference. The game is alive and well. I can do public commits and updates starting October 3, when my current work contract ends. Post you questions, feedback and issues here and/or on the git page. Ebony Spire - Heresy community · Replied to HedoNNN in Is this game dead? Did a small update to github with the current local changes. Upgrading my tablet right now. Lacking the space on it for a Visual Studio install in order to rebuild the host. Even if I add rebindable keys the problem is I didn't account for special keyboard keys to be pressed (up arrows and CTRL key) at first so I need to re-build the host for it! Going to take a lil while! I've uploaded an old SDL host I had lying around which should work with my logical files and has support for special keys. Download it from here and tell me if it works ( https://drive.google.com/file/d/0B_4zTDv0yMEbM215Q1cyQTRhcDQ/view?usp=sharing ). If so I can upload the rebindable keys files for you to use. Else, I'll do a github and game update tuesday or after I get back from Clujotronic (busy with a game dev festival)! Hm, you'd have to edit the source code. I'll make an update tonight (just got home) with a config file for keybindings. It will go up on github for now. Problem is with the arrow keys. Might have to rebuild the host to support 'em. I'll post an announcement with the next update. Ebony Spire - Heresy community · Posted in Is this game dead? @HedoNNN: Now I'm at a pc. In short, I haven't committed much on GIT lately due to my work contract (non-competition clause) that started getting enforced kinda late. Quit my job and starting October 3 I'll be working at another non-game dev company. I can publicly do commits and work on my games. I should probably start doing more commits! Can I launch a Marine as a torpedo towards an enemy ship? That would be a cool way to board other ships and would make ship combat more butclenching, as in, "Shoot the enemy ship to lower it's shields but be careful because you can run out of Marines"!